The Pillow Talk Cheeky Wand is soft, elegant, stylish and powerful. This beautiful massager is the go anywhere piece you have been waiting for. Cheeky is covered in a soft touch silicone making the experiece sensual while power makes the massager effective. The flexible neck feature allows for you to massager deeply into all those areas which need relaxation. The Pillow Talk Cheeky Wand is soft, elegant, stylish and powerful. This beautiful massager is the go anywhere piece you have been waiting for. Cheeky is covered in a soft touch silicone making the experience sensual while power makes the massager effective. The flexible neck feature allows for you to massager deeply into all those areas which need relaxation. Or use to stimulate external erogenous areas of the body. Pillow Talk Cheeky Wand – a soft powerful massager ideal of anyone. When in use the Pillow Talk Cheeky is not only comfortable but simple to operate. The one touch button conveniently located on the stem operates with a single touch to turn on. By holding the button down you can increase the speed to your hearts desire. But do not be fooled by the appearance as while Cheeky looks soft, the power within her is amazing. The deep rumbling vibrations put out by the internal motor are super strong. Starting from a comfortably low level, you can take Cheeky’s speed to a ultra stimulating level. Once you have finished a single touch of the control button will turn the piece off. The easy grip handle and flexible neck make the Pillow Talk Cheeky the perfect massager. Powerful vibrations through the head target muscular stiffness when applied while the head movement allows you to get into the most sensitive of areas. The entire piece is covered in super luxurious body safe silicone. 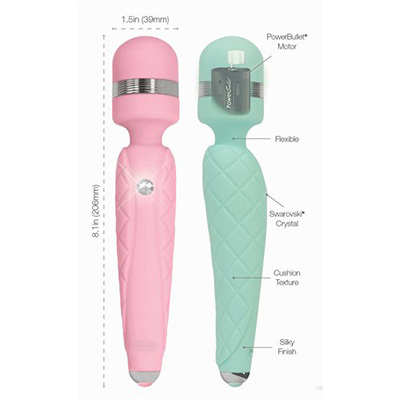 The on/off button on the handle of the massager features a dazzling clear Swarovski crystal. It is this attention to details which makes the Pillow Talk range so popular. The Pillow Talk Cheeky is fully rechargeable and features a travel lock so it will not accidentally switch on when you are taking it on holidays with you. Width - 3.9cm at widest.